The roundtable at the start of the discussion. Photo © 2017 David Lee Preston. produce a joint memorandum establishing a working group dedicated to facilitating these objectives. Organizers Vitaliy Nadashkevych and Alexander Nazar. Photo © 2017 Vadim Tader. The working group (including the signatories to the memorandum and other regional heritage activists) will also provide a forum for sharing information and needs associated with heritage projects, and be a kind of clearinghouse for keeping track of projects, exchanging ideas, sharing information on available grants and other resources, and coordinating multi-town collaborative projects, especially education. 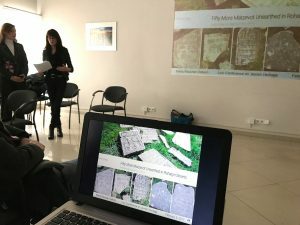 Although the roundtable was convened to focus on surviving Jewish sites specifically in the Lviv Oblast, Rohatyn Jewish Heritage and several other organizations were invited to participate because of common interest and proximity to the Lviv region. Rohatyn Jewish Heritage has been actively managing projects in Rohatyn in the Ivano-Frankivsk Oblast to recover Jewish headstones and to commemorate the prewar Jewish community there, for six years now. Mayors of Zolochiv, Staryi Sambir, and Dobromyl describe the progress and issues of Jewish cultural heritage efforts in their towns. Photo © 2017 Marla Raucher Osborn. 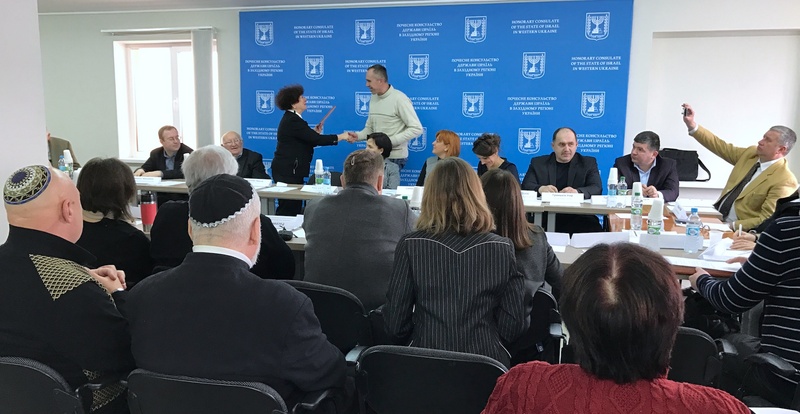 The roundtable was held at the Lviv office of the Honorary Consulate of the State of Israel in Western Ukraine at vul Hazova 36/3, and sponsored by the JDC-supported Lviv branch of Hesed-Arieh – All-Ukrainian Jewish Charitable Foundation and the Lviv Volunteer Center. 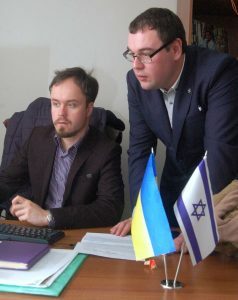 Included were mayors and representatives from several towns in the Lviv Oblast which have surviving sites of Jewish built heritage, including Dobromyl, Staryi Sambir, and Zolochiv; several of these representatives presented ideas for new projects to preserve heritage (for example, the synagogue in Staryi Sambir) or commemorating Jewish individuals or sites of destruction (for example, mass graves in Zolochiv). Representatives from Lutsk, active in projects in the Volyn Oblast, participated as well. Lviv Oblast administrators outline regional policies and plans for heritage preservation and management. Photo © 2017 Marla Raucher Osborn. Also participating were the Deputy of the Lviv Region State Administration, the regional administration’s Department Director for Culture, Nationalities & Religious Matters, the Deputy Mayor for Development of the City of Lviv, the Director of Lviv’s Center for Urban History of East Central Europe, the Director of the Lviv branch of GIZ GmbH (a German organization active in physical rehabilitation of many of Lviv’s historically significant buildings), plus local and national leaders of the Ukrainian Jewish religious community (including the Chief Rabbi of Kyiv and Ukraine of the Progressive Jewish Congregation), and representatives from the Embassies of Poland and Germany. Speaking on behalf of Jewish descendants living abroad was Dr. Aharon Weiss of Jerusalem, himself a Galitzianer, born in a small town near Boryslav. Olga Blaga-Maletska attended from Rohatyn’s regional museum “Opillya”. Photo © 2017 Jay Osborn. Among the many attendees listening to and participating in the discussion were historians, heritage specialists, and educators from Lviv and the region, including Olga Blaga-Maletska from Rohatyn’s regional museum “Opillya”, scheduled to re-open in spring; we were very happy to finally meet her in person. Other visitors from beyond the region but with connections here included David Lee Preston, Assistant City Editor for The Philadelphia Inquirer, and his wife Ronda Goldfein, an attorney for the Aids Law Project, in town as part of a family heritage trip that also included a visit two days prior to Staryi Sambir’s Jewish sites. The roundtable provided an opportunity for David and the Mayor of Staryi Sambir to meet, opening a communication path between the two for possible future cooperation. In total, about 60 people joined the roundtable, in addition to local media. 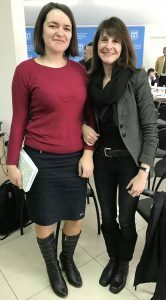 Interpreters were provided to those who do not understand Ukrainian. Alexander (Sasha) Nazar of the Lviv Volunteer Center and Vitaliy (Vito) Nadashkevych of the National Academy of Scientific Development served as moderators; Adel Dianova, Director of Hesed-Arieh Lviv, was host of the day’s event. Vito opened the day’s discussion by noting that the vast majority of Jewish cemeteries in western Ukraine are neglected today, lacking nearby Jewish communities with family connections to those buried there. Because of post-War Soviet efforts to erase ethnic identity and physical culture, it is also not uncommon for foreign descendants of pre-war ethnic groups (Jewish, Polish, and others) who visit their ancestral towns in Ukraine to know more about the towns’ multi-cultural history and heritage than the modern local population. Roundtable host Adel Dianova of Hesed-Arieh Lviv presents awards to activists of Dobromyl for their work preserving local Jewish heritage. Photo © 2017 Jay Osborn. 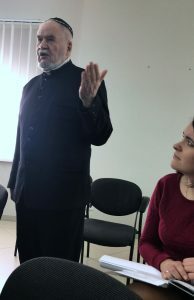 Rabbi Faynerman of Lviv encourages immediate activism for the large number of Jewish heritage issues in the area. Photo © 2017 Jay Osborn. those with practical experience, for consultation and advice. The Jewish community of Staryi Sambir was established in the 16th century, grew to prominence, then was destroyed in the Shoah, leaving behind a number of surviving sites of Jewish built heritage including two synagogues and a cemetery, considered one of the largest in western Ukraine. The Lviv Volunteer Center is organizing a new project in cooperation with the city administration to restore one of the Staryi Sambir synagogues, and plans are underway for an investigative visit later this month so that both budgetary and architectural plans can be produced. 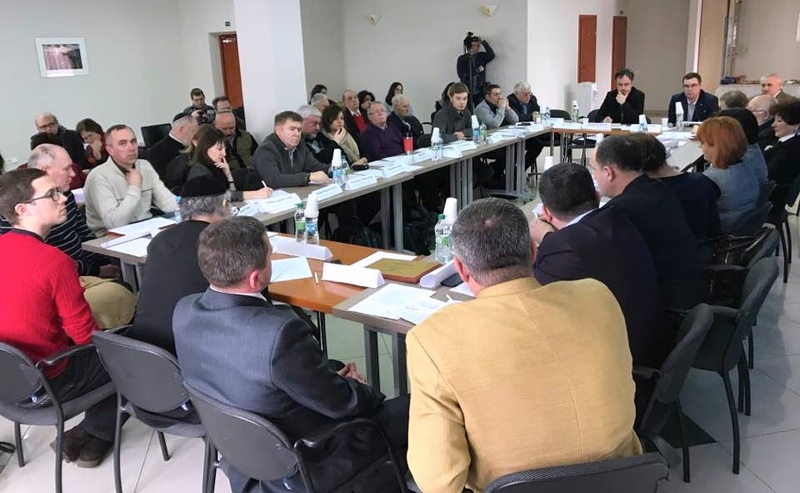 The Mayor of Staryi Sambir described possible uses for the restored building, including as an education and cultural center, noting that the town’s current small regional history museum might be expanded to the renovated synagogue space. The Mayor concluded his remarks expressing the City’s openness for cooperation with others. The Lviv Volunteer Center plans to host a work camp clean-up at the Jewish cemetery and synagogue this summer, and some funding has already been identified to support this new project. Marla presents the several preservation and education projects of Rohatyn Jewish Heritage. Photo © 2017 Jay Osborn. 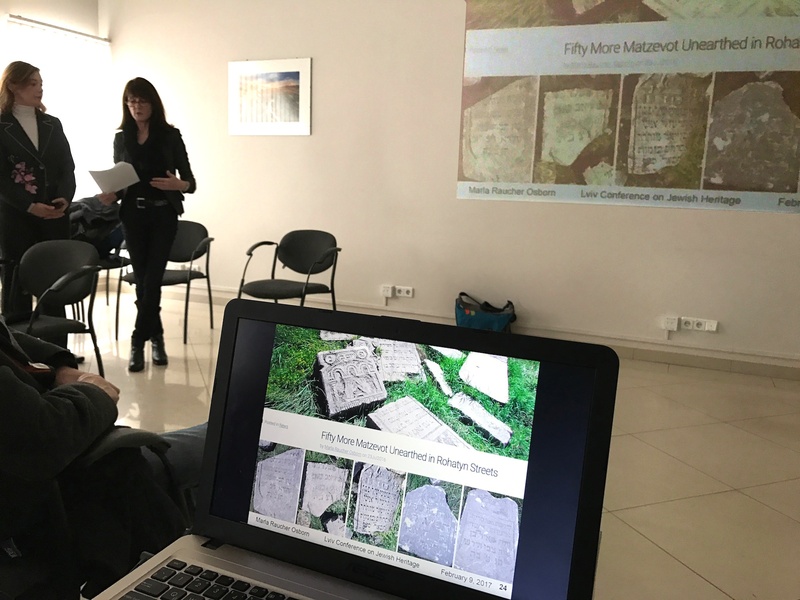 Rohatyn Jewish Heritage, newly-qualified as a Ukrainian NGO, made a presentation summarizing its heritage work over the last six years, plus projects underway and planned for 2017, including the non-invasive archeological survey of Holocaust-era Jewish mass grave sites scheduled for spring. The NGO was represented by founders Marla Raucher Osborn and Jay Osborn, accompanied by Alex Denysenko of Lviv who has been a key interface and supporter of our heritage work in Rohatyn since 2011. The Mayor of Zolochiv reviewed the many historic sites of his town, including work that has been accomplished in the last few years to mark Jewish mass graves and assume protection of the Jewish cemetery. The town has been actively working to document its multi-ethnic history, and the Mayor specifically noted the resources they have been using from the Center For Urban History on Jewish and non-Jewish Zolochiv history and heritage sites. Dr. Aharon Weiss emphasizes the importance of tolerance and education in cultural heritage work. Photo © 2017 Jay Osborn. Several participants voiced their belief that education is one of the most important tools for recovering and protecting cultural heritage, and an essential starting point for most projects. Many ideas were exchanged for this component of the work, including both recent Lviv City school initiatives and the local history projects for school children in smaller towns through Hesed’s Wheel of History program and a Russian program called “Complex Memorial”. Each of the administrative organizations and the NGOs presenting at the roundtable highlighted the educational facets of their projects and methods. Dr. Weiss emphasized his belief that the key point is to understand each other, between people of all ages, with special emphasis on the youngest. In this region, where Jewish culture developed and blossomed over centuries, there is now a great opportunity to enhance mutual understanding. 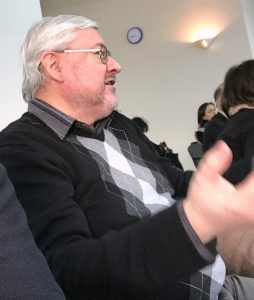 Regional historians and professors participated freely, providing context and advice. Photo © 2017 Jay Osborn. 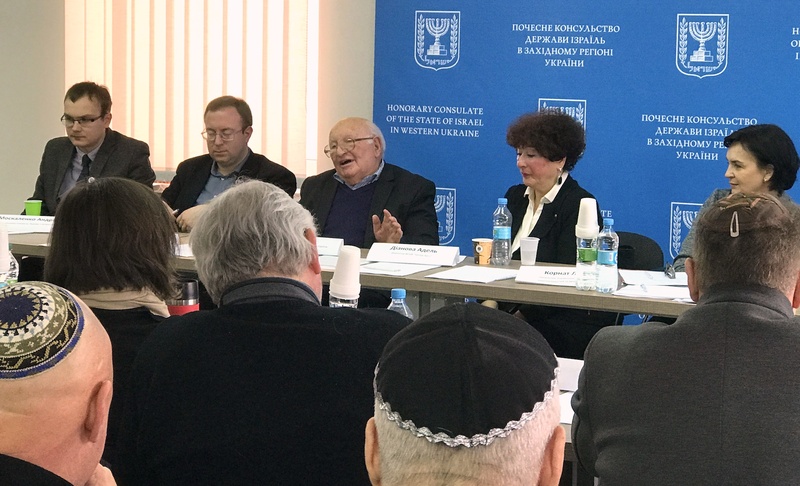 Several participants raised themes of Jewish culture as shared Ukrainian culture, and as living culture in Ukraine both before and after World War II. Rabbi Dukhovny from Kyiv reminded attendees how the Shoah started – from a policy of division of people into we vs. they – and the importance of memory for building a future. Several speakers noted the importance of diversity in a united civil society and as a driving force in mixed-cultural Ukrainian heritage programs. Vito noted that many small towns and villages with heritage concerns look to Lviv, the largest city in the Oblast, for examples and as a model, but that sometimes it is the small towns and villages which on their own launch and successfully manage local heritage projects (Jewish and non-Jewish) even without significant supporting infrastructure, and that from these examples, Lviv can also learn. Before concluding the roundtable, participants were reminded that one of the tangible goals of the meeting was to produce a joint statement of cooperation – a formal memorandum – outlining principles and establishing a working group for regional cooperation and collaboration. To that end, participants were invited to return after lunch for a post-conference workshop. At that workshop, issues of regional scope, multi-cultural scope, practical incentives, and outward communication were discussed further. The signatories to the memorandum gather for a group picture. Photo © 2017 Lviv Volunteer Center. The memorandum was revised and completed, then circulated and signed by 15 organizations and individuals, who also posed for a group photo. Rohatyn Jewish Heritage gives special thanks to Natalia Tolok (Ната Толок) for interpreting and translating for us throughout the day, and to Sasha Nazar and Vito Nadashkevych for the invitation to participate. Rohatyn Jewish Heritage, proud signatory to the memorandum, looks forward to continuing discussion with many of the roundtable participants and working toward establishing joint cooperative projects. Almost two hours of the roundtable discussion has been posted in video form to YouTube, in two parts. Click on the links here to see and hear the discussion in Ukrainian: Part 1 (the Rohatyn Jewish Heritage presentation begins at 35:05), and Part 2.